One of many challenges in the conservation of biodiversity is the recent trend in the frequency and intensity of extreme climatic events. The Shark Bay World Heritage Area, Western Australia, endured an unprecedented marine heatwave in 2011. Catastrophic losses of habitat-forming seagrass meadows followed, along with mass mortalities of invertebrate and fish communities. Our long-term demographic data on Shark Bay's resident Indo-Pacific bottlenose dolphin (Tursiops aduncus) population revealed a significant decline in female reproductive rates following the heatwave. 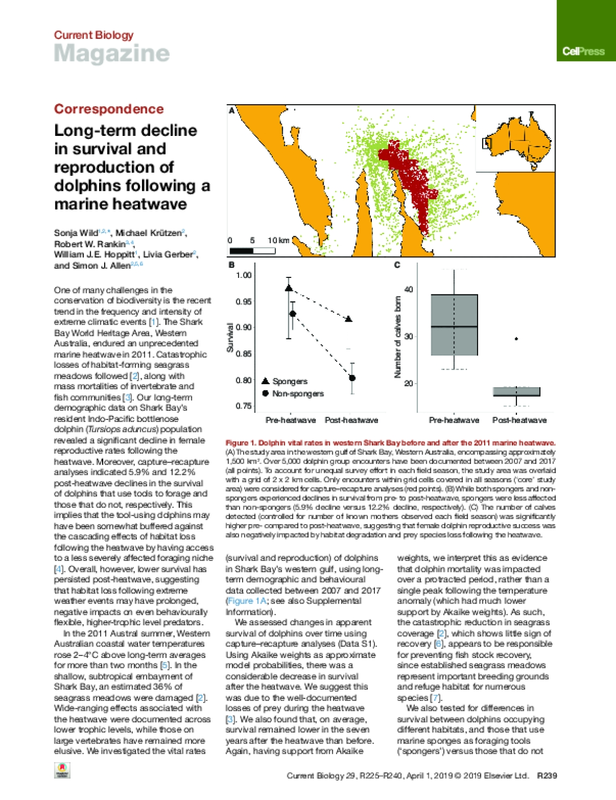 Moreover, capture–recapture analyses indicated 5.9% and 12.2% post-heatwave declines in the survival of dolphins that use tools to forage and those that do not, respectively. This implies that the tool-using dolphins may have been somewhat buffered against the cascading effects of habitat loss following the heatwave by having access to a less severely affected foraging niche. Overall, however, lower survival has persisted post-heatwave, suggesting that habitat loss following extreme weather events may have prolonged, negative impacts on even behaviourally flexible, higher-trophic level predators.